What have we been up to lately, you ask? 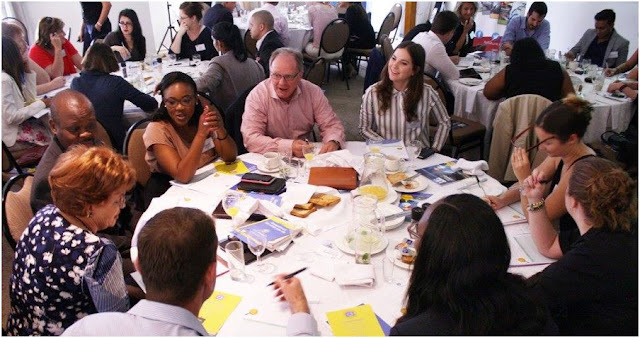 Well, we had the privilege of hosting a breakfast event with HR Future at their HR Future Breakfast Club last week. The event allowed us the opportunity to share some insight and concepts regarding behaviour, engagement and gamification within the reward and recognition (R&R) space. We also had a look at some tips in developing an R&R strategy. We wouldn’t want anyone to feel left out, so we are dedicating this week’s blog to summarise the things you need to know. Nice of us, we know. The culture of an organisation plays an integral part in its performance. That is why, in the search for creating high performance organisations and teams, the question of culture keeps popping up. So how can we define and tame this daunting beast of a concept called organisational culture? Well, in its most basic form, culture is merely made up of the day-to-day habits of individuals and teams. So if we want to create an organisational culture, this would be a good place to start. Define the habits that form the essence of the culture that you want to create, and then find practical and meaningful ways of encouraging and enforcing those habits. A key in creating habits is also understanding what motivates people. Two of the main needs that individuals have is to belong and to feel valued. Motivational and behavioural theories overlap in a way that gives us a clearer insight in to how we can utilise reward and recognition in organisations in order to meet these needs. The table below shows our interpretation of the motivational theories of Maslow and Herzberg together with the needs that can be directly impacted by R&R. There is a pretty exciting overlap between this and employee engagement as well, but more on about that on another day. From these theories we see that R&R speaks directly to two needs levels, while it may also speak to more (depending on how it is set up). The question then becomes, what is the best way to do this? We know that people respond to the manner in which information is communicated and accessed. We also know that people want to be able to take part, be recognised for their efforts, belong to their groups, know how they compare to those groups, and of course.. have fun! Enter gamification. Work and fun does not have to be mutually exclusive. Similarly, no activity needs to be boring, and you can turn most things into a game if you really wanted to. As an example, we had a look at The Speed Camera Lottery (https://www.youtube.com/watch?v=iynzHWwJXaA) a fun experiment that changed driver behaviour through introducing gaming. One of the biggest aspects of getting, and keeping people involved in anything is feedback, more specifically real-time feedback. This is integral to gamification, and should be non-negotiable in R&R as well. Some other aspects of a game that should be considered include: it has a clear objective; it offers choice of actions to be taken and reward to earned; it connects people and allows for interaction; it recognises achievements (big and small); and it centres on competition. When we apply this to R&R we align our strategies to include rewards with choice, the freedom to recognise others, social appeal and interaction, fun, and technology. The last event of the breakfast was a practical activity of designing and budgeting for an R&R strategy. We talked through the process of determining the elements of your R&R programme, and also the ways to set up your budget accordingly. If you would like any additional information on any aspect of this blog, or if you need assistance with designing, or budgeting your R&R programme - give us a shout at info@workpoints.co.za, or set up your own free trial on our Workpoints website and try it for yourself! PS: Shout out to Amanda Mohr for her contribution and presentation on the day.